Here's an inexpensive and easy Halloween Craft. Get some Butternut Squash. Be sure they "stand up". In addition, you'll need white and black acrylic paint and a brush or 2. Paint the squash with the white paint, all over. Once they dried, I laid them down and painted the bottom. Covering the entire squash keeps it from rotting. After the white paint dries, paint some large spooky black eyes. That's it - I arranged mine in a planter on my front stoop. 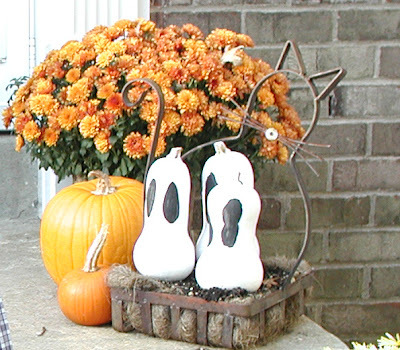 You could put them in a window box, lined up on your step or anywhere else that needs a little spooking up. I think that even I could manage to make this! :) What a cute idea! How cute!! I think even I could do this one!! The kids would love it!